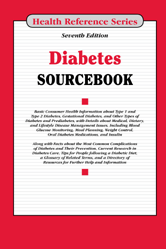 Diabetes Sourcebook, Seventh Edition provides basic consumer information about the different types of diabetes and how they are diagnosed. It discusses strategies for controlling diabetes and managing daily life challenges. It includes information about the complications of diabetes and their prevention and offers guidelines for recognizing and treating diabetic emergencies. Chapter 56 — Are Proteins in Infant Formula Linked to Type 1 Diabetes? Section 62.1 — What Is Pancreatic Islet Transplantation?